There’s always sunshine above the clouds. Even when all you see is a thick, gray, impenetrable mass, just on the other side, the sky is blue. 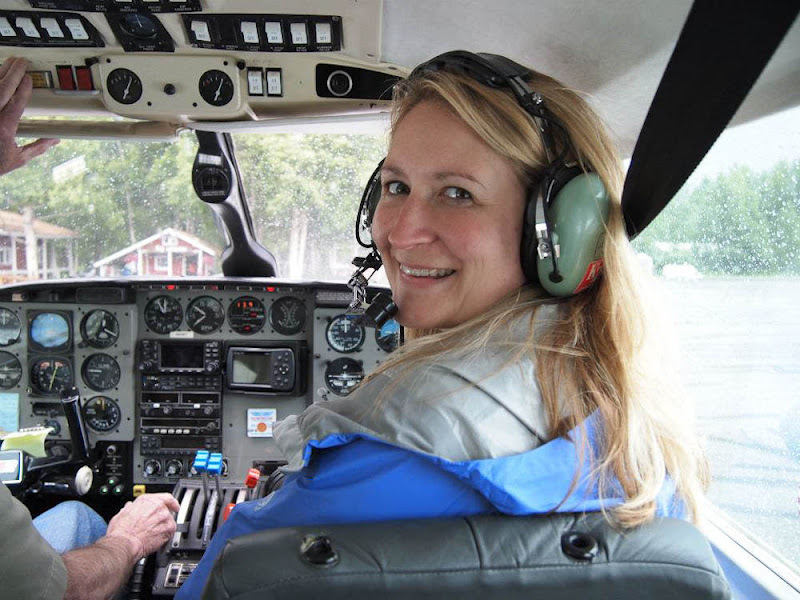 Last week while on vacation in Alaska, my friend and I went on a flightseeing tour of Mt. McKinley. 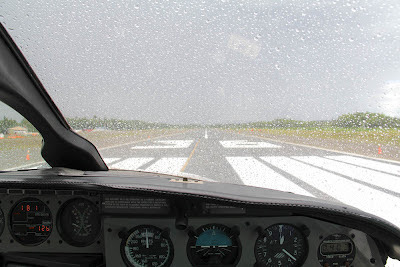 When they loaded us onto the 8-seater, twin-engine prop plane, there was a damp chill in the air, wind was blowing sideways, and rain kept threatening to test the durability of my new raincoat. I was certain they were taking us for a run for our money. How could we possibly see any sights during such a storm? As we lifted off and the wipers on the front windows swish-swished to keep up with the falling rain, I admit, I said a few prayers. When we were high in the sky, absorbed by clouds, the pilot pointed to a tiny patch of blue above us at about 11,000 feet. I said another prayer. He aimed the plane for the blue hole, and like a rabbit into its warren, we charged through the opening in the clouds and arrived in a sparkling, glistening world filled with glorious mountain peaks, puffy white clouds, and the brightest sun imaginable. It was so magical I think I even saw a few angels. Simultaneously, I felt both extreme peace and overwhelming exhilaration. 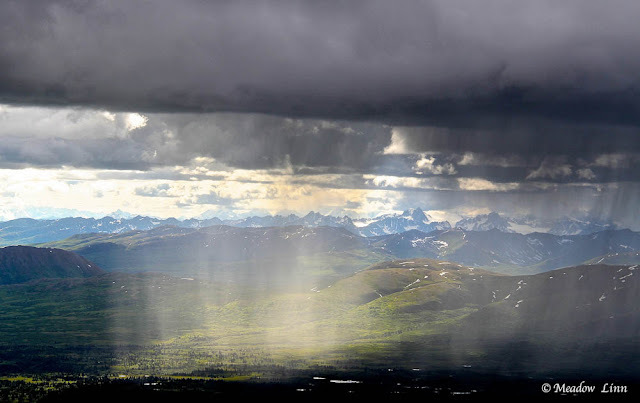 For so much of my life, dating has felt like I was stuck beneath the clouds. No matter how hard I tried, it seemed I couldn’t find my “forever man,” or when I thought I had, it would turn out that I was not his “forever woman.” I’m realizing, however, that there’s always sunshine, sometimes it just takes some effort to get there. Although I haven’t yet found “the one,” there’s been value in the time I’ve spent beneath the clouds. I’ve needed this time to experience the many facets of my life and explore the different routes to find bliss. I’m aware of the sunshine waiting for me above the clouds, but I’m not yet ready to find the patch of blue and make a beeline through it. There’s still a lot I want and need to do beforehand. If I’d met my Prince Charming a few years ago, I don’t know that it would have been the right relationship for the long run. I’m still in the process of figuring out who I am and what I want to be. The life I lived ten, five, even two years ago is very different from the one I’m living now. The man who would have fallen in love with me then, might not be the same man who would fall in love with me today. Of course, we all continue to grow and change, and my essence is still the same, but the work I do now and the demands on my time are different. Even some of my interests and values have shifted. In this period of transition, I feel myself taking off, like the airplane, heading for unknown territory. As soon as I figure out where I’m heading, I’m feeling pretty confident that the clouds will part to reveal my little patch of blue sky, and the man of my dreams will be waiting for me on the other side. What is it that you’re yearning for? Is it a relationship, a home, a job, a vacation? Are you really ready for it? If there were something you needed to do, become, release, or accomplish before you could have this thing, what might it be? Even if your conscious mind doesn’t have a clue, imagine that you did know…what would it be? Here’s to finding our path and spreading the clouds to see the blue sky and shimmering sunshine above! The wild lands and frigid seas of Alaska are inextricably linked in my mind with salmon. While traveling in Alaska, I had some delicious wild salmon; however, none I enjoyed quite as much as this one. This is one of my most asked for recipes. It’s not uncommon to hear, “Usually I don’t like fish, but this salmon is incredible. What did you do?” The truth is…this is a simple recipe. The secret is high-quality, fresh fish cooked with love. Sockeye is a red salmon, and though it tends to be slightly dry, it’s very flavorful. 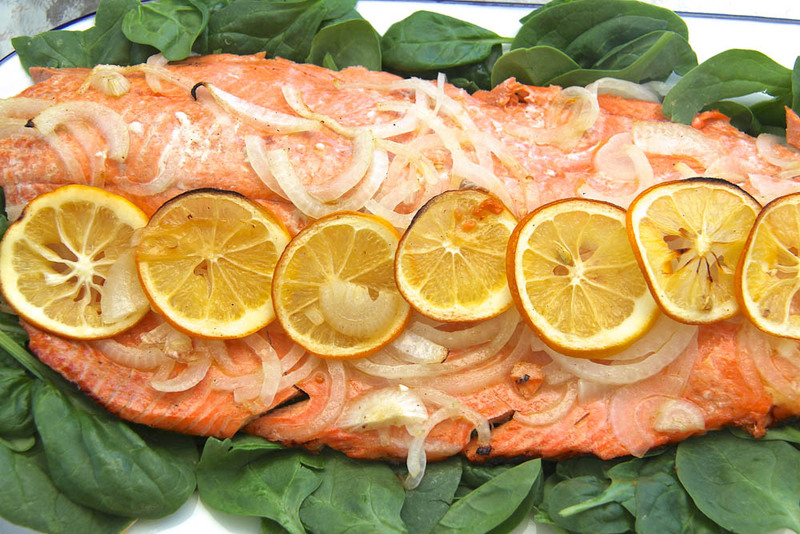 The addition of olive oil ensures the salmon stays moist and delicious. For best results, use wild salmon; this dish will not taste the same with farmed salmon. Serve with the dill rémoulade on the side. With boiled potatoes and corn on the cob, this is a summer feast you’ll return to again and again. 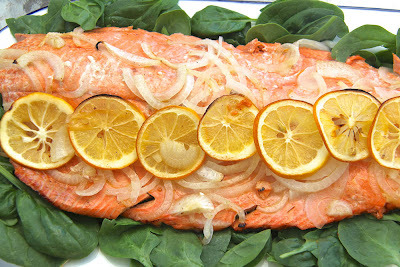 Line a baking sheet with multiple layers of foil, making sure that the foil layers are at least a few inches longer and wider than the filet of salmon. Place the fish skin side down on the foil. Fold up the edges of the foil and crimp them to prevent any liquid from escaping. Drizzle the olive oil and the lemon juice over the salmon. 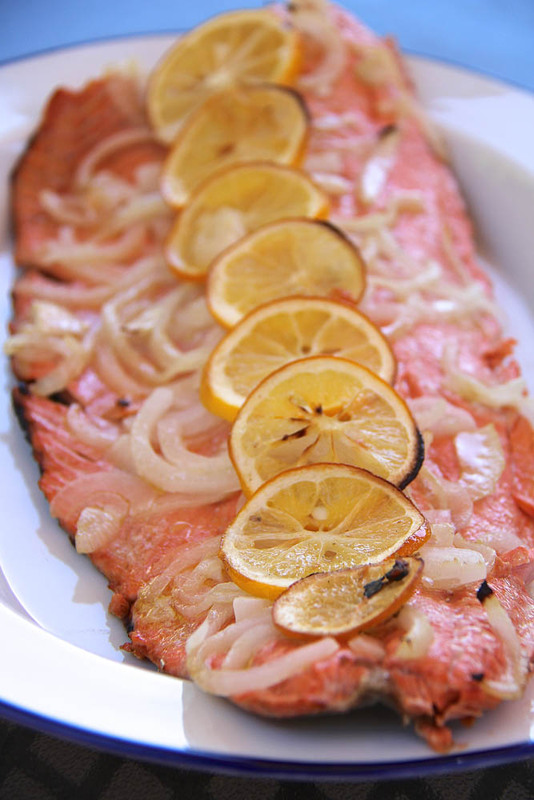 Use a small spoon to “baste” the salmon with the oil and lemon juice that pools on the sides. Sprinkle the salmon with salt. Evenly distribute the thinly sliced onions over the fish. Lay the lemon slices on top of the onions in a neat row (the thinner they’re sliced the better, as they’re meant to be eaten with the salmon). Reduce the heat on the grill to medium. Transfer the fish and the foil to the grill (the baking sheet is just to help with transport). Grill until the fish is slightly firm and no longer red. It’s important, however, not to overcook the fish since sockeye can be dry if cooked too long. Depending on the heat of your grill and the thickness of the filet, it should take about 10-20 minutes. To serve, use a metal spatula to loosen the salmon from the skin (which should be stuck to the foil). With a spatula in each hand—one on either end of the filet—gently lift the salmon (minus the skin) from the foil and transfer to a platter. In a small bowl, mix the mayonnaise, dill, lemon juice, garlic, and salt. I usually can’t help but dip in my fingers, potatoes, or whatever is available. Yum! I loved the photos from the sky. It brings back memories of a family vacation to Alaska 15 years ago. The salmon recipe will be a new favorite. That first photo is pure magic. Can't wait to try the recipe. GLORIOUS posting, Meadow!!! Your photo of Mt. McKinley is absolutely breathtaking! I cook my salmon in a very similar fashion but I'm going to try your recipe the next time. And I want to make the sauce. Sounds nummy! What a joy and gift you are!